Qais Ahmed is available and will most likely play this match. After a short interval, the Big Bash League (BBL) will be back in action on Thursday. Over the next four days, there will be a total of five games that will be played. Six teams, who are competing for the semifinal places, will get an opportunity to test their fortunes. 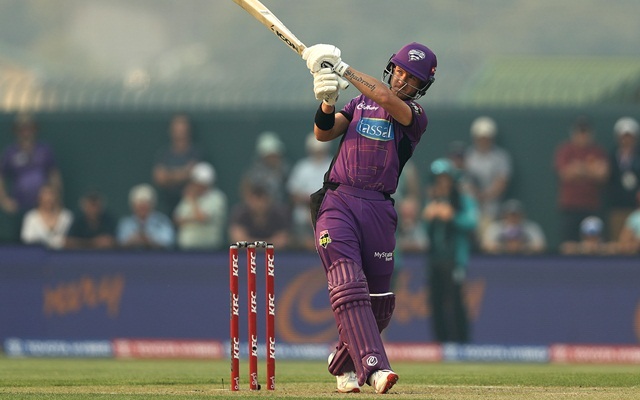 It will be the Hobart Hurricanes against the Melbourne Renegades in the first of those games. This encounter is an absolute dead rubber and the result will have no impact on the overall standings. If the Hurricanes win, they’ll seal the top spot on the points table. The Renegades might have an opportunity to top in case they register a victory. 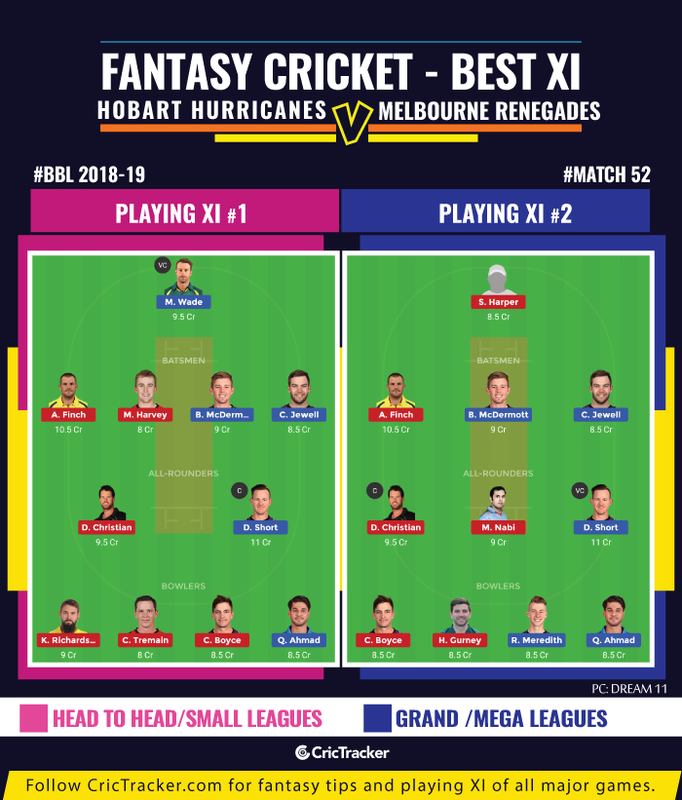 While the Melbourne franchise has won three games consecutively before this encounter, the Hurricanes lost in their previous match against the Adelaide Strikers. It should be a great battle given that these two teams have been playing some terrific cricket this season. The 52nd match of the Big Bash League (BBL) 2018-19 will be played between Hobart Hurricanes and Melbourne Renegades at the Bellerive Oval in Hobart. The match starts at 7:30 PM local time (8:30 AM GMT) (2:00 PM IST). It is a great batting pitch at Hobart where the average scores have been quite high. The Hurricanes won all the four games that they played at this venue in BBL 2018-19. On each of the four instances, they were the chasing team. Hence, it is advisable to field first after winning the toss. Matthew Wade (C & W), D’Arcy Short, Caleb Jewell, Ben McDermott, George Bailey, Simon Milenko, Qais Ahmed, David Moody, Jofra Archer, Riley Meredith, Clive Rose. Aaron Finch (C), Marcus Harris, Mackenzie Harvey, Sam Harper, Tom Cooper, Mohammad Nabi, Daniel Christian, Chris Tremain, Cameron Boyce, Kane Richardson, Harry Gurney. Bench – Jack Wildermuth, Jon Holland. Riley Meredith has recovered from his illness. Qais Ahmed is signed as the overseas replacement for the injured Tymal Mills and will be available for selection. Marcus Harris will join Renegades as the Test series against Sri Lanka has come to an end. Daniel Christian has got a great record while playing in Hobart. He scored 259 runs at an average of 25.9 with the bat. Moreover, he accounted for 13 wickets from 18 matches including a 5-wicket haul. D’Arcy Short, the leading run-scorer this season, is a must as captain or vice-captain. Matthew Wade, Aaron Finch, and Kane Richardson are the other options for captaincy. You can choose between Daniel Christian, Caleb Jewell, and Cameron Boyce as your vice-captain. Qais Ahmed, Jofra Archer, and Mohammad Nabi are the other options available. The Hobart Hurricanes could seal the top spot with a brilliant win in this game.